Smoked chicken with panzanella was todays sous vide dish. I brine the breasts on the bone in 4 cups of salt and 1 cup of sugar mixed with 10 litres of water for 32 hours. I then rinse and dry the chicken vac pac it with 1 cup of chicken stock and cook it for 3 hours at 68.5°C. The chicken is then smoked in my hot fish smoker for 20 minutes over rosmary wood. This produces a very fragrant and moist meat which combines well with the rich flavours from the hierloom tomatoes that Brad and Helen Harvey www.bradsproduce.com.au are some how ripening this late in autumn. I delivered an SV25 Sous Vide to Fed Squares Taxi Dining Room this morning. Over the coming weeks Michael Lambie has agreed to provide a recipe and Redfish Bluefish will venture into Taxi to take some photo’s of the dishes that they are creating for this blog. 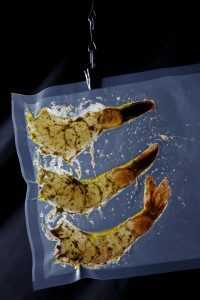 Devein the prawns and rub with a mix of equal quantities of fennel, lime and sumac season to taste and seal in a pouch with a squirt of extra virgin olive oil on medium. Cook for thirty minutes at 56°C in your water bath. For the salad seal the potato in a pouch with salt and EVOO, and the carrot in a separate pouch with sugar, salt and EVOO to taste. Cook for thirty minutes at 80°C in your water bath. Toss all salad ingredients with dressing and serve topped with prawns. I will be sad to say good-bye to – 12-hour lamb noisette with organic zucchini flowers, pine nuts and currants from our restaurant menu this week. Meagan Bertram and Steven Briggs Yarra Valley Gourmet Greenhouse zucchini flowers have been consumed by powdery mildew at last, so it is time to move on. We were buying the lamb noisette in one piece, removing most of the sinew and trimming the fat cover to even it up. Then rubbing the inside of the noisette with Greek oregano, lemon zest dried under the heat lights, confit garlic, EVOO and seasoning it very well. The noisette was then rolled and tied to form a tight cylinder and bagged with a ladle of cold chicken stock on medium high. 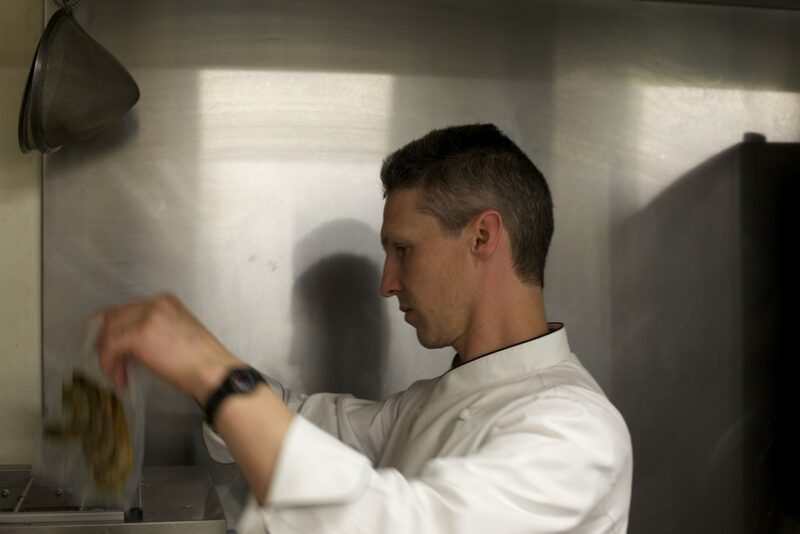 We cooked the lamb for 12 hours at 54ºC then cooled it quickly in ice slurry for two and half hours. We found that cooling was necessary to set the fat layer on the out side of the roll or sealing it was impossible. After cooling, the lamb was returned to the bath at 54ºC for 30 minutes to an hour during service. As ordered the portions were removed from the bath, unbagged, sealed in a hot pan with olive oil, seasoned, then rested for ten minutes before serving. The resultant dish is a beautiful pink roll of lamb, with a dark crisp well seasoned skin and a soft almost confit texture to the meat. I am currently serving this Chicken and Pistachio terrine with baba ganouche on the platter at Stones of the Yarra Valley. 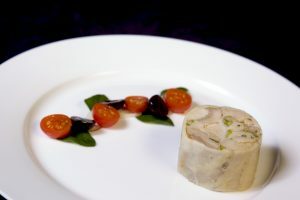 This terrine can be rolled as a whole chicken or as two smaller terrines. Skin the chicken starting at the back being careful to remove the skin in one piece. Remove all of the meat from the chicken and cut in to strips. The thigh meat is best if cut across the grain. Weigh the meat and add 1% of its weight in salt, add all other ingredients and massage them into the meat. Allow the mix to rest for an hour letting the flavours develop. In the mean time make a white stock from the bones. Pass it and then chill it. Lay a piece of commercial glad wrap on the bench and spread out the chicken skin. Season the skin with salt and pepper, then carefully form the meat mix into a cylinder shape on the skin. Wrap the skin over the filling then roll in the glad wrap to form a bonbon, twisting the ends tightly. Slip the wrapped terrine into a vac bag with a bay leaf and 125 ml of the chilled chicken stock. Seal on medium high using the liquids plate for vac machine. 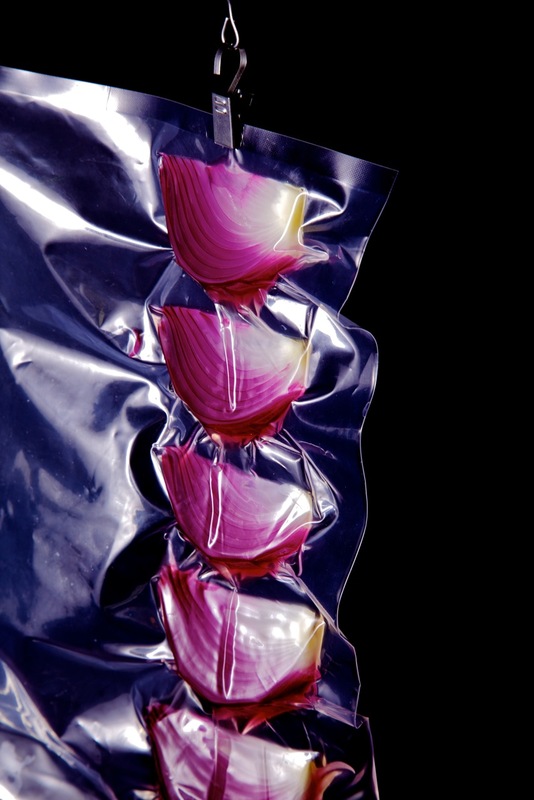 Cook for three hours at 68ºC in a sous vide then cool rapidly in an ice slurry or blast chiller. 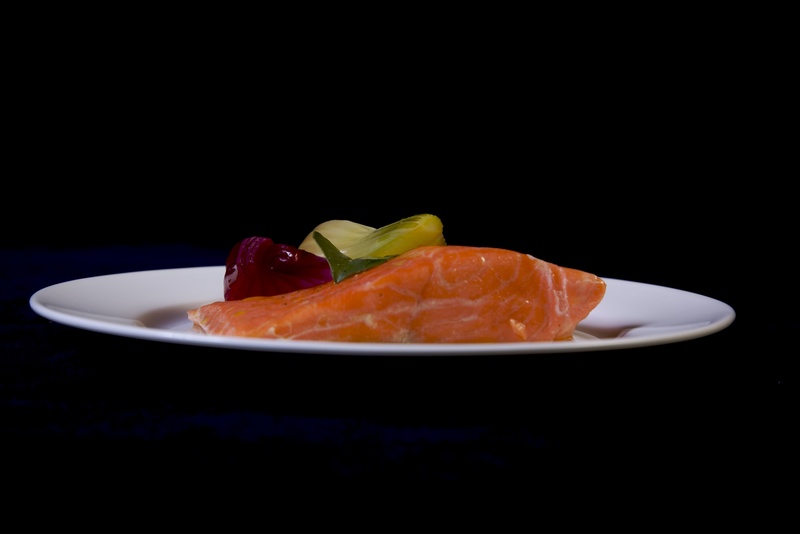 Salmon sous vide was the dish that hooked me. I have slow cooked salmon for years, in oil at 60ºC, in the rational at 80ºC with low fan till half cooked then down to 50ºC. Nothing can give you the clean velvet feel of the dish below. Clean and pin bone salmon removing all traces of the blood line. Portion fillet. Vacuum pac on medium high with a touch of extra virgin olive oil and a pinch of Scilian air dried sea salt. Cook to order for 12 minutes at 56ºC. Allow to rest for 2 minutes before serving. Wash onion and drain well. 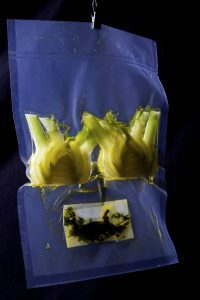 Wrap spices and ginger in cling film to make an herb sachet (can be seen with fennel on recipe page). Mix sugar with vinegar and add to vacuum pouch with onion and herb sachet, vacuum on medium high. Cook at 65ºC for 90 minutes, cool in ice bath or serve immediately. Wrap spices, thyme and bay in cling film to create an herb sachet, add to a vacuum pouch with fennel and all other ingredients. Vacuum on medium high. Cook at 70ºC for 90 minutes, cool in ice bath or serve immediately. 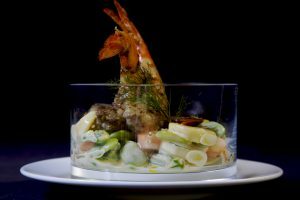 To serve I would toss the drained fennel and Spanish onion with a little mint, parsley, wild fennel sprigs a some lugarian olives dressed in a simple lemon and thyme dressing. Cumin salted duck breast wrapped in wombok with rocket and figs. Lay the wombok leaf out on a sheet of cling film. Place the duck breast in the centre of the wombok leaf. Roll the leaf around the breast then roll tightly in the cling film and twist the end to form a bon bon. Vacuum in a pouch with a spoon of chicken stock. 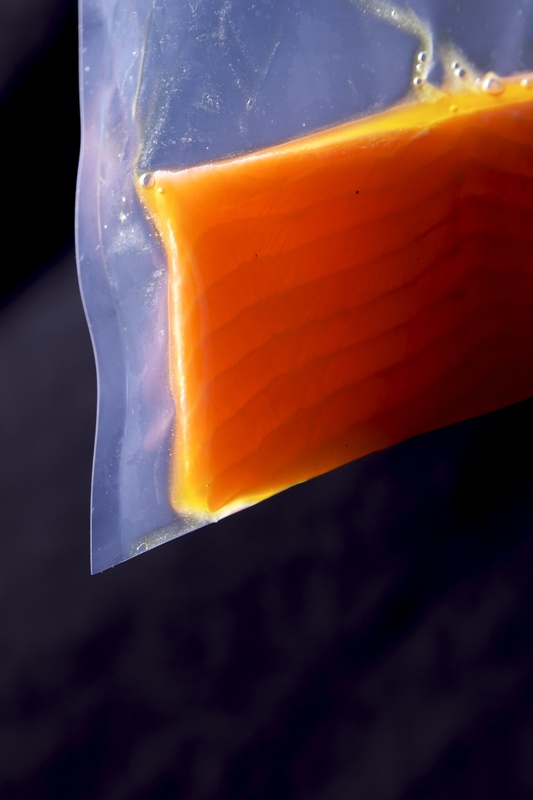 Cook in your sous vide at 60ºC for 25 minutes. Remove from the water bath and rest for five minutes. Unwrap duck breast and slice, serve with fresh fig and rocket, maybe a little 25 year old balsamic and EEVO.